With oral DNA testing, we can improve your preventive dental care and enhance diagnostics for even greater smile health. Oral DNA testing can give you greater smile health. It is one of the newest dental diagnostic technologies used today. With your oral DNA test, we can better craft customized dental treatment plans for you. We will be able to zero in on your specific risk factors based on your genetics. There are various oral DNA tests to cover a range of issues, giving you thorough dental care. 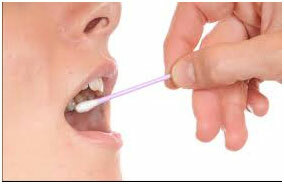 With oral DNA testing, your saliva sample is sent to a lab that performs the oral DNA testing. The lab will test your saliva for various highly destructive bacteria. They will search for bacteria that increase the risk of gum disease, tooth decay, and even HPV. HPV can increase your risk of oral cancer, which is why we test for it. Oral DNA testing will help us identify the bacteria that cause periodontal disease. This assists us in better fighting this destructive and common dental illness. With oral DNA testing, we can determine your genetic susceptibility to help you come up with a game plan for prevention. Most patients should see our dentists twice a year and brush and floss twice daily as recommended, but if you’re at increased risk for periodontal disease, we can recommend more frequent visits or modify your home dental hygiene routine. Oral DNA testing can also help us discover if you have HPV present in your mouth. This is one of the most common viruses worldwide. It can make you more susceptible to oral cancer. Diagnosis improves our ability to diagnose oral cancer and offer early treatment. When you visit Dr. David C. Montz & Associates in Pearland, Texas, you’ll receive state-of-the-art dental care. Advanced dental technology, like oral DNA testing, can make your dental appointments run more smoothly. Trust us for all your oral health needs! Call our office today to schedule an appointment for friendly, effective dentistry!